I suppose there is a reason why I read non-fiction very seldom. Sometimes, when I do, and especially when I am the one who selected the book/author, then I have a good experience reading it. Such was the case when I read Salman Rushdie's memoir as well as the memoir of Ayaan Hirsi Ali. Other times however, I hated the experience, and it simply made me think, what were these guys smoking? Such was my experience with Erich Fromm and Robert M. Pirsig. Now unfortunately I have to say that this current book was not the most positive reading experience for me. But weirdly enough, this book is composed of writings by authors who, individually, I actually liked. It's just that when they all come together in one book, I hated it. See, this book was actually given to me by a good friend. I thank her for that. And truth be told, I liked the concept. This book is the collection of the Nobel Prize lectures of the Nobel Prize for Literature laureates, for twenty years, from 1986 to 2006. Basically, these were the lectures of Wole Soyinka all the way to Orhan Pamuk. While I don't know every one of them, in their midst are definitely some authors whose works I have enjoyed, such as Harold Pinter, José Saramago, and Naguib Mahfouz. However, I find myself not liking the fact that I have here in my hand 20 different lectures of 20 different authors, because while I admire these authors individually, when they are all together in one book, it simply feels like it's a collection of soapbox moments. Let me explain what I mean by that. I suppose we can all agree that while there might be authors who write simply because they want their readers to be entertained, perhaps we can safely assume that most, if not all, Nobel Prize winning authors are not like that. Or rather, the people who selected them to win didn't think they were writing simply to entertain. No, they were writing instead because in some respects, they were activists. They were writing because they were protesting something, whether it is religion, or apartheid, or Communism. After all, they do say that the pen is mightier than the sword. And I sincerely believe that. For the most part, perhaps that is what the Nobel Prize lecture is designed for. It's a chance for the Nobel laureate to explain herself, and vocally express her views on winning the prize, as well as her path that lead to this moment. Except when you have twenty of those lectures in one book, it doesn't feel weighty anymore. Instead, it feels like it's a collection of twenty different rants from twenty different authors. Every ten pages, there is an essay trying to argue for yet another different cause. Of course, some of these causes I am more sympathetic to, but having all twenty of them in one single book, reading them one after another, that is just a disappointing experience. I suppose what this means is that I take issue with the format. Sure, the format is one big issue here. But sometimes, it also made me think about the role of the author in society. Yes, an author is in theory an expert in literature. It would have been nice if the Nobel Prize lecture celebrating her works of literature is about literature, and the philosophy behind it. It was nice reading the experiences of authors and how these experiences shaped their lives and writing, which lead them to winning the prize. 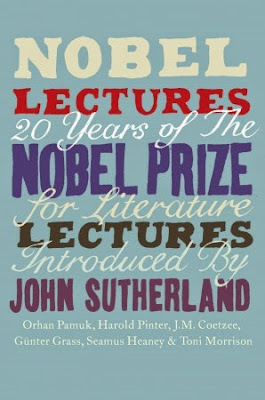 But sometimes, the Nobel Prize winners use the Nobel lecture not to talk about literature, but about their own pet issue. Take Harold Pinter's lecture for example. Don't get me wrong here; I sympathize with his issues. I sympathize with his objection against the War in Iraq. Yet in my view, he picked the wrong audience for his rant. He was in Sweden to give a lecture after winning the Nobel Prize for Literature, and yet he gave a lecture not on his works, not about literature, but about his activist agenda. I feel pity for the audience that night, as they were for all intents and purposes, a captive audience. This makes me think about the role of writers in our lives and in society. As I said before, writers are the intellectual movers and shakers. Political regimes and societies have been built based on the ideas of some writers. There is nothing wrong with that. However, sometimes it seems that some writers forget that. While there might be ideas that look grand on paper, sometimes it is easier said (or written, for that matter), than done. Overall, while I liked some lectures in this book, especially those from the ones who really knew why they were getting the prize, as a whole I did not like the reading experience provided by this book. I cannot say I would recommend it. I give it 2 out of 5 stars. - Orhan Pamuk's, because it was about literature, its value, his passion for it, and also about his joy in receiving the Nobel Prize itself. - Saramago's, because since he had to give the most important speech of his life, he could as well - and he did - use it to remind his audience - the world - of one of their most shocking attributes, which is their ability to ignore extreme poverty and suffering. And since I am on this theme, and because the subject of non-fiction has been mentioned in this post, I will mention again the one that I would be surprised if anyone disliked: ''The Most Good You Can Do'', by Peter Singer. Sorry if I am being annoying for bringing that up again! Yes, I did like those speeches. As you said, their speeches were appropriate for the occasion, which, in my opinion, is about literature, first and foremost, as it is an award about literature in the first place. It's those speeches which deviated and focused more on other things that annoyed me.